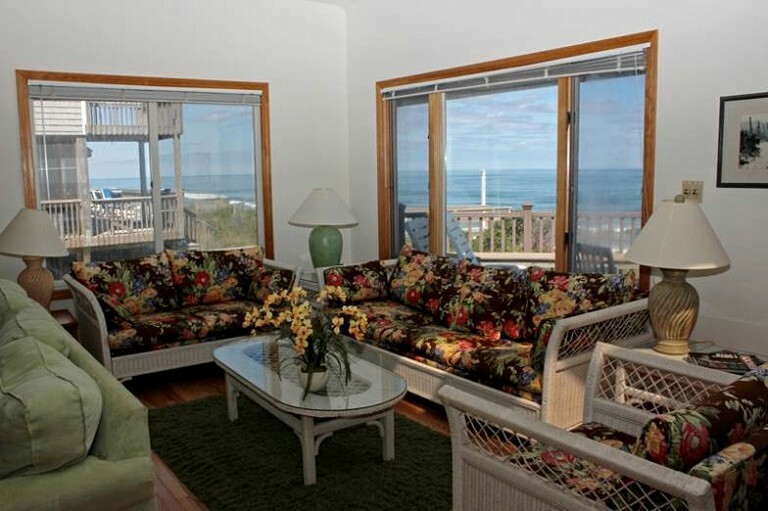 This beachfront cottage is located in Duck, North Carolina near the Currituck Beach Lighthouse and can accommodate 10 guests. 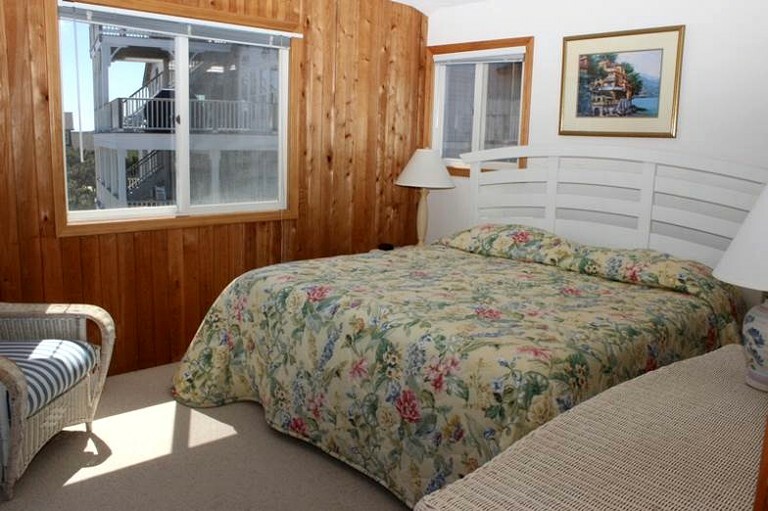 There are four bedrooms and four bathrooms. 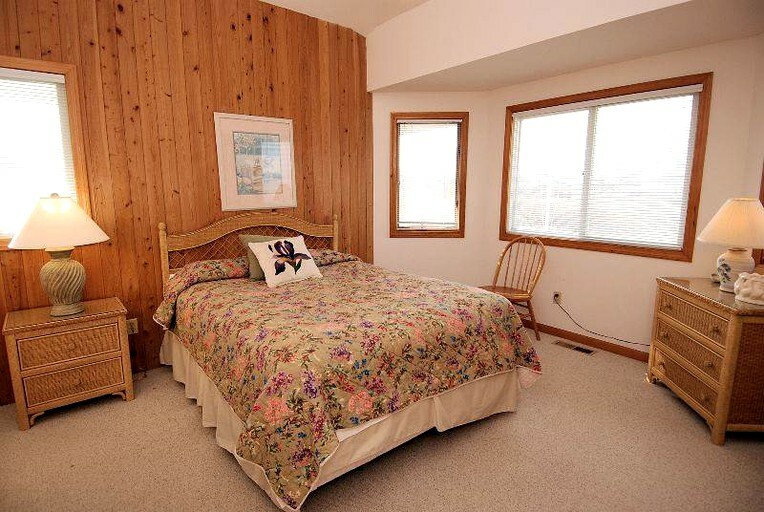 Colorful quilts, pine wall accents, surfing decor, and soft floral prints bring a bit of the outdoors to the bedrooms. 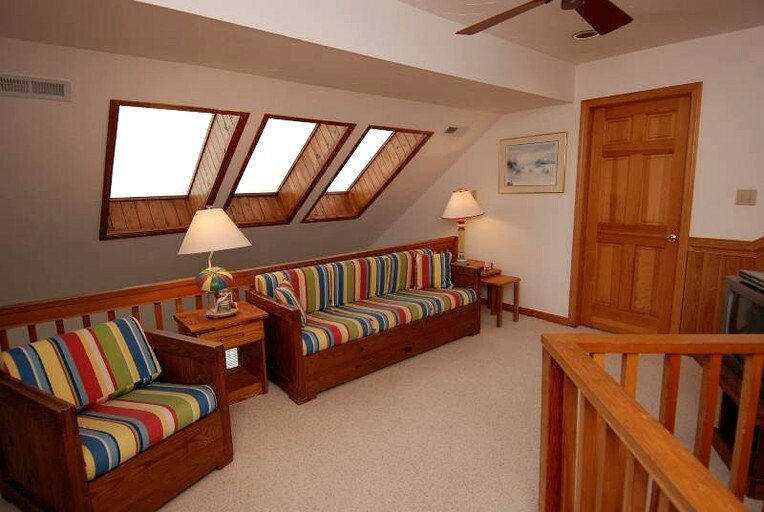 On the main level of the cottage, there are two bedrooms. One has a queen-size bed and one has two twin-size beds. 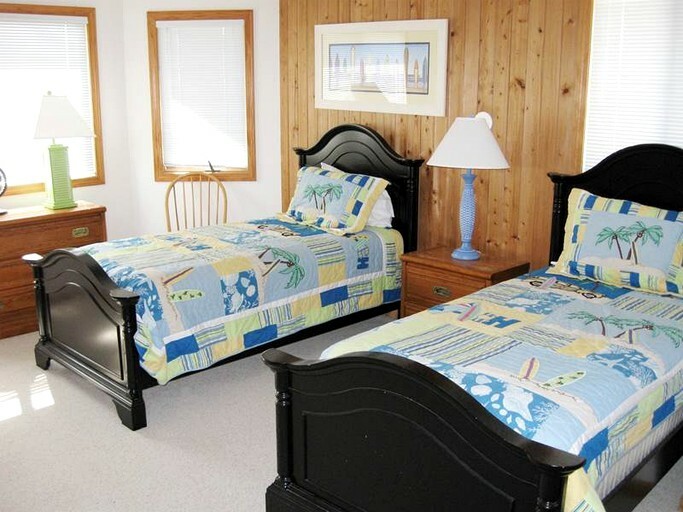 The top level has a bedroom with a king-size bed, and one bedroom with two twin-size beds. There is also a queen-size sleeper sofa in the living room. Linens and towels are provided. 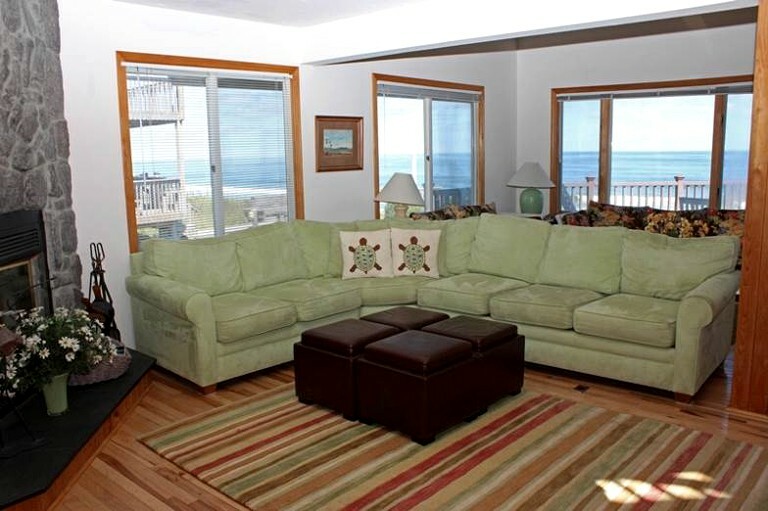 The main living area is accented with sage green, floral prints, and ocean-inspired decor. 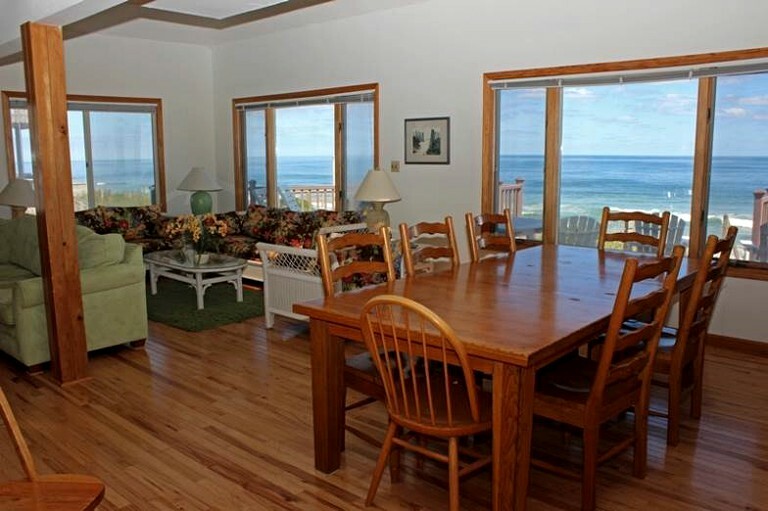 The living room has a wraparound sofa, a chair, a loveseat, and a television and from here, large windows look out onto the beach. 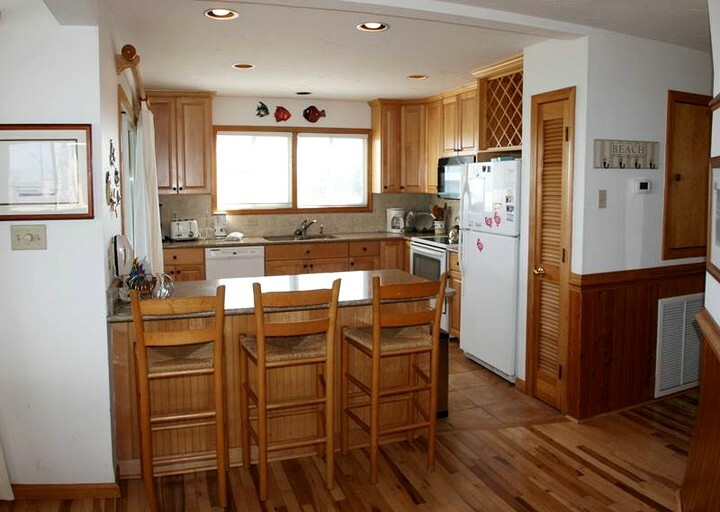 The fully-equipped kitchen has a refrigerator, a stove, a microwave, a dishwasher, a coffeemaker, and a breakfast bar with three stools. A spacious dining table seats eight. 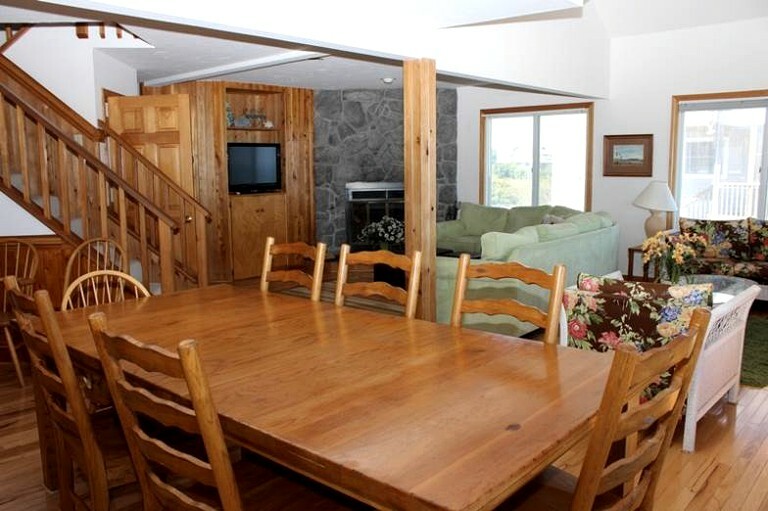 Just off of the kitchen is another area with a small table and four chairs for additional dining space. 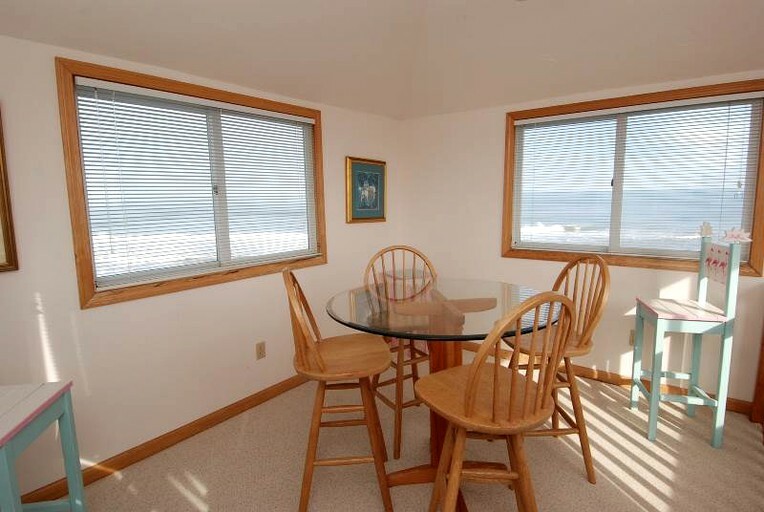 Other amenities include Wi-Fi, a DVD player, a CD player, and a book collection. Additionally, there is a washer and dryer. 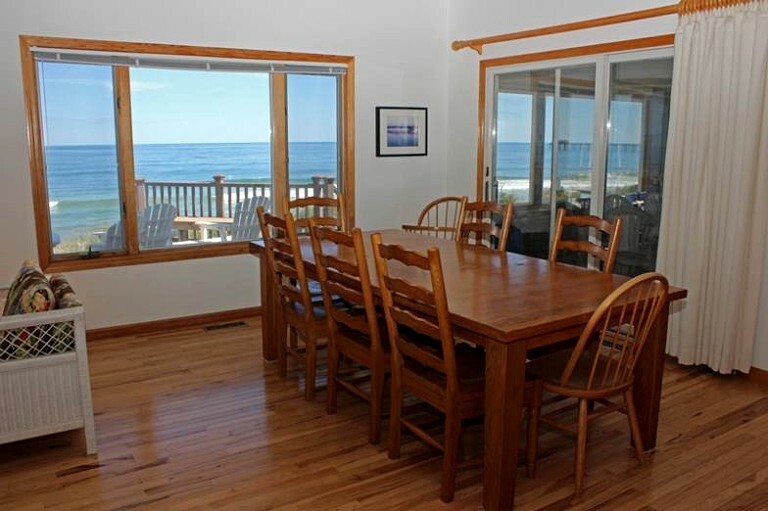 Located on the oceanfront, this cottage has a private and lit boardwalk to the sand. Guests have access to a community pool. 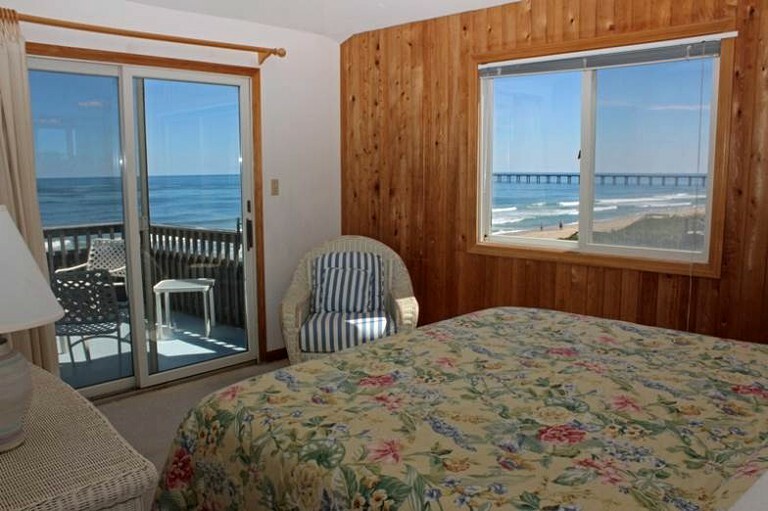 There is a crow's nest that offers great views of the ocean, the sound, and the surrounding area. For outdoor entertainment, guests can challenge each other to a game of horseshoes. An outside shower is a great way to wash off the sand before entering the cottage. Linens and towels are provided. 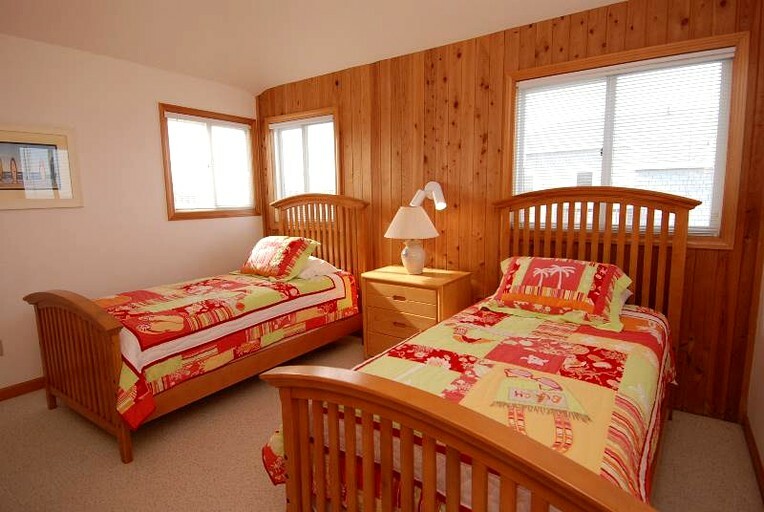 All beds except for top bunks, sleeper sofas, and trundle beds will be made ahead of time. Linens will be provided for guests to make those beds if needed. 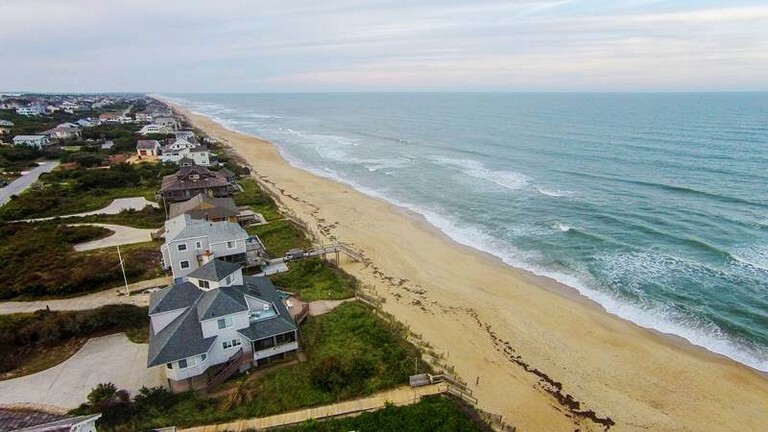 Swimming, surfing, and boogie boarding along the shores of the Atlantic Ocean are popular ways to enjoy a day in the Outer Banks. 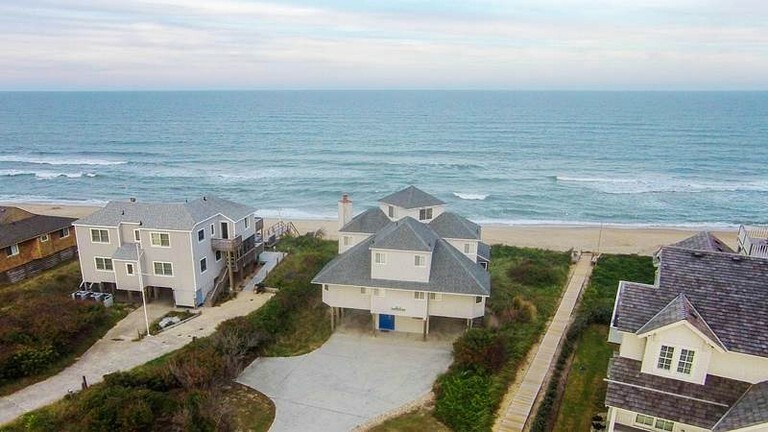 Beaches in Duck, Kitty Hawk, and Nags Head are perfect for families, couples, and groups. 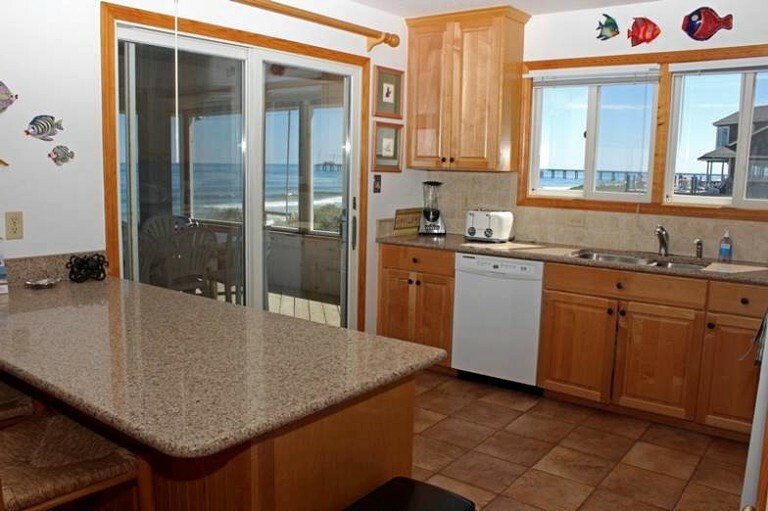 Guests can also book offshore fishing charters, dolphin watching cruises, and ATV tours of the Corolla 4x4 country. Other activities include sunrise beach yoga sessions, hang gliding at Jockey's Ridge State Park, and paddleboarding in the Sound. When the waves are gentle enough, it's even possible to paddleboard and kayak in the Atlantic. The H2OBX Waterpark is a fun way to slip and slide the day away. It is about 25 minutes away, back across the Wright Memorial Bridge, in Powells Point. Hours of shopping fun can be had at local surf shops, boutiques, outlet malls, and art galleries around the island chain. 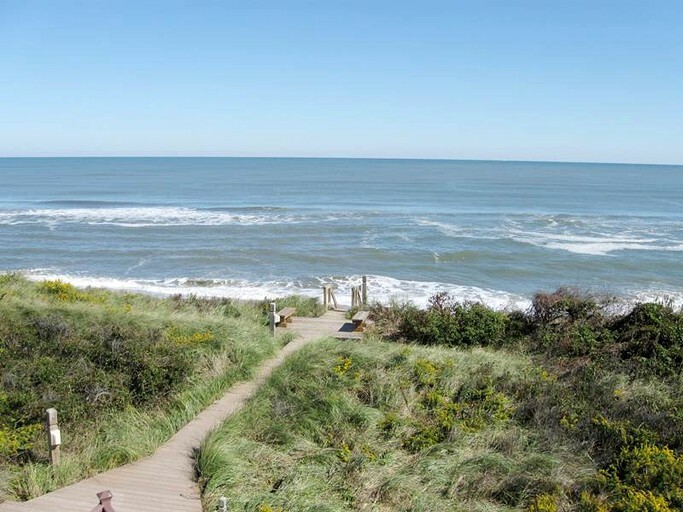 Fans of nature and wildlife will want to add Pea Island National Wildlife Refuge and Cape Hatteras National Seashore to their lists. History enthusiasts should plan a visit to the Currituck Beach Lighthouse, the Bodie Island Lighthouse, and the Cape Hatteras Lighthouse. 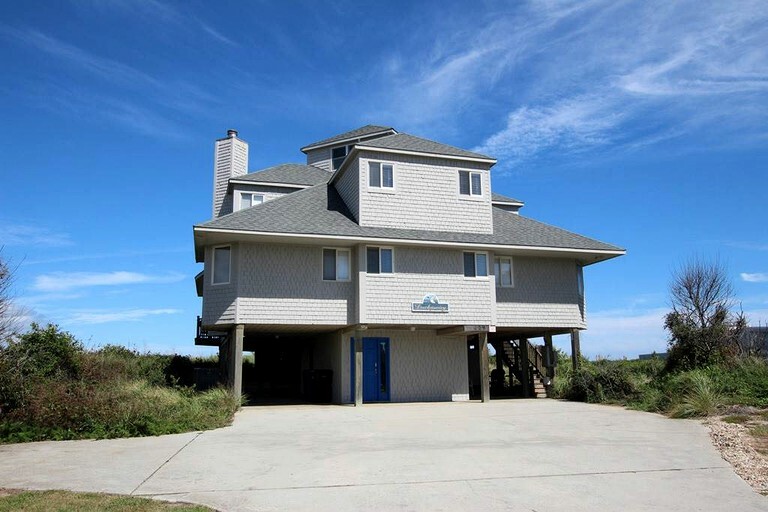 In addition, guests can learn about the maritime past of the Outer Banks by visiting the Roanoke Island Maritime Museum or the Graveyard of the Atlantic Museum on Hatteras Island. This is a non-smoking and no-pet property. There is a fireplace, but it is not available to use.